Djokovic is aiming for a record seventh men’s Melbourne title, while Nadal can become the first man in the Open era to win all the Grand Slams at least twice. Sunday’s match will be an ATP record-extending 53rd meeting between them. 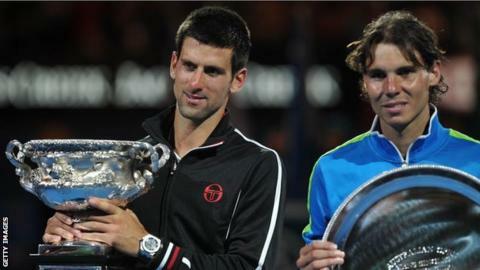 “It is the biggest rivalry we’ve seen in tennis history,” Australian former Wimbledon champion Pat Cash said. The top two seeds meet at Melbourne Park for the first time since their epic five-set final in 2012, which Djokovic won with almost six hours on the clock. Djokovic, 31, leads their head-to-head 27-25, with eight victories in their past 10 matches – including their memorable 2018 Wimbledon semi-final five-setter which stretched over two days. “I’ve played so many matches against him, epic matches on this court,” said the Serb. Spaniard Nadal, 32, said he was happy to have shared “very special moments” on court with Djokovic. Djokovic set up the tantalising final with a comprehensive semi-final win over French 28th seed Lucas Pouille, which he described as one of his best performances in Melbourne. Spain’s Nadal, meanwhile, has not dropped a set in his six matches here. Whoever wins will move closer to Roger Federer’s all-time record of 20 Grand Slam victories, although Australian great Rod Laver believes Djokovic is best placed to overhaul the Swiss. 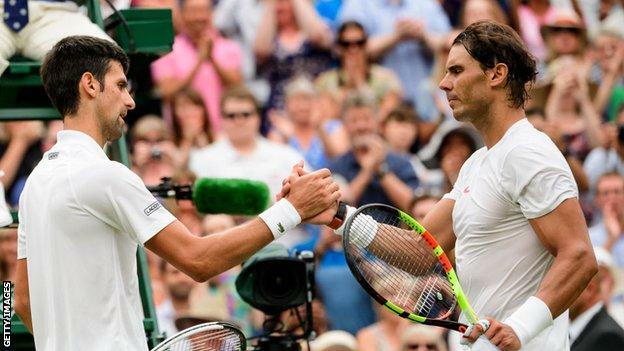 Djokovic has won 14 majors after his Wimbledon and US Open victories last year, while Nadal has 17 after claiming the 2018 French Open. “When you look at his age and form in winning the last two, I’d say Djokovic has the best chance of eclipsing Federer,” said 11-time Grand Slam singles champion Laver, 80. Djokovic says beating Nadal at Wimbledon last year “mentally turned things around the most” for him. Ranked outside the world’s top 20 earlier that year after elbow surgery, Djokovic beat Kevin Anderson in the final for his first Grand Slam title since the 2016 French Open. He followed that by winning the US Open in September and reclaiming the world number one spot in November. “Winning against Nadal 10-8 in the fifth set, that has catapulted me mentally to a different, more confident self,” Djokovic said. “I am happy that I am competing that well that early. That’s the most important thing,” he said. “I felt myself playing well in practice before the tournament. Then you have to compete, see if you can make that happen in the competition. Emerson, 82, said he is backing Nadal for victory because he does not want to see his record, set in 1967 and matched by Federer in 2018, beaten. “Well, I don’t want Djokovic to do it,” he joked. “I don’t have that many records to brag about. “But my six doesn’t look too good. “Djokovic is still young and can still make all sorts of records. Nadal’s big push in the off-season has been his serve, trying to get it on to the opponent much faster than he had been. That allows him to play offensive in the second or third shot in the rally. The toughest person to do that against is Djokovic, the best returner, and it will be interesting to see if Rafa tries to do anything differently – tries to put more miles per hour on his serve than their last meeting or if he tries to take the next ball earlier. The way Rafa has played this tournament has been exceptional – but that’s not easy to do against Novak.